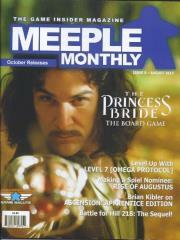 #8 "The Princess Bride, Ascension - Apprentice Edition"
Meeple Monthly: The Game Insider Magazine is published monthly and distributed by ACD Distribution to hobby game retailers everywhere. Meeple Monthly features articles written by insiders in the hobby gaming industry, sharing with you information you can't get anywhere else! Learn about what will hit the game shelves months ahead of time!